Since it first opened in August 1889 The Savoy has been synonymous with luxury. The Savoy was the first luxury hotel in Britain, having electric lights throughout the building, electric lifts, and bathrooms in the lavishly furnished rooms with hot and cold running water, also many other innovations we now take for granted. Our taxi turned into Savoy Court leading to The Savoy Hotel, which is the only named street in the United Kingdom where vehicles are required to drive on the right, this is said to date from the days when a taxi driver would reach his arm out of the driver’s door window to open the passenger’s door (which opened backwards with a front handle), without having to get out of the cab himself, our taxi door however was opened by dapper Savoy doorman. Following a multi-million pound refurbishment lasting nearly three years The Savoy reopened in October 2010 where the level of luxury and refinement is greater than ever before. The Thames Foyer with its winter garden gazebo is very much the heart of The Savoy, the stunning glass dome floods this sociable spot with wonderful natural light and beneath a pianist serenades guests as they enjoy The Savoy’s world-famous Afternoon Tea, available from 1:30 pm to 5:45 pm daily but remember to pre-book! 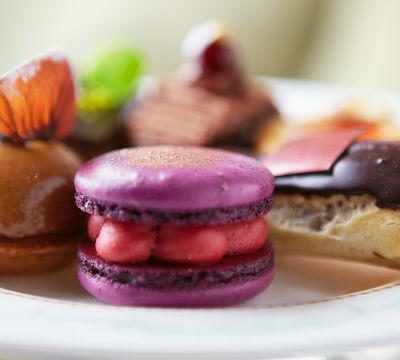 The Savoy’s Afternoon Tea is an enduring custom where guests can choose from a range of teas served with finger sandwiches, homemade scones with clotted cream and jam and a selection of seasonal cakes and pastries created by The Savoy’s Executive Pastry Chef, Ludwig Hely. Her Ladyship and I were guided to our seats in the Thames Foyer and after looking at the wide and varied menu we chose the Traditional Afternoon Tea, and why not as this is what The Savoy is famous for?!? Other options are available and with 24-hour notice all dietary requirements, including coeliacs, can be catered for meaning you can take your gluten free friends for Afternoon Tea! Out of the 30 options for tea to drink Her Ladyship decide upon The Savoy Afternoon Tea, which is a unique blend of Ceylon and Darjeeling tea, this tea is light, crisp and refreshing with a graceful citrus lift. 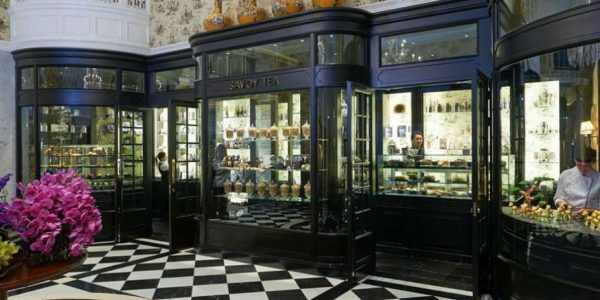 I on the other hand went for The Savoy Breakfast Tea, which is a robust classic blend with rich malty sweetness and a rich finishing flavour, all the teas available are loose leaf and go perfectly with The Savoy Traditional Afternoon Tea delights that are on offer. 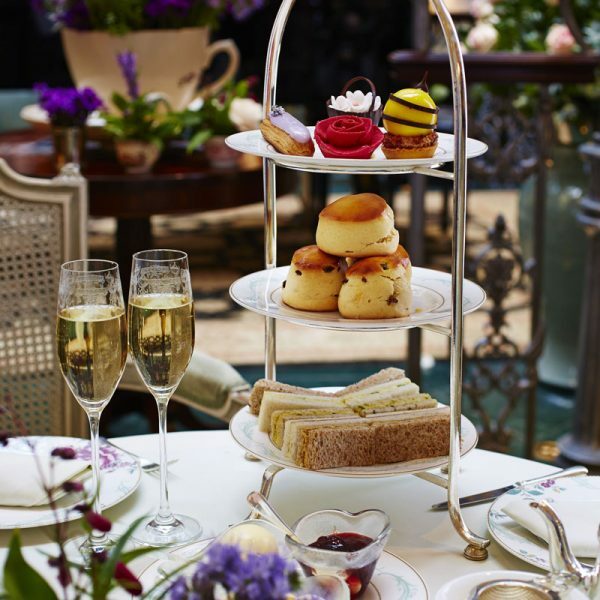 The Savoy Traditional Afternoon Tea is served on matching china and consists of four courses with first and second courses being the finger sandwiches and scones served on a delightful tiered cake stand. Each sandwich out of the five flavours had the bread matched to the filling that gave a new and interesting depth of flavour. The scones were neatly wrapped in a napkin to stay warm and came with a choice between plain or fruit, they were light with the option of jam or lemon curd which made a good alternative, combined with clotted cream the overall result is delicious. While enjoying our delicious tea service the Ladyship and I noticed that the waiting staff had on their uniforms the motif of a bird. On asking we were told that this was inspired by the story of The Savoy birds. In 1918 a young girl staying at The Savoy visited Covent Garden and noticed a man selling songbirds, she begged her nanny to buy them all, as she felt sorry for them being held prisoner in their cages. 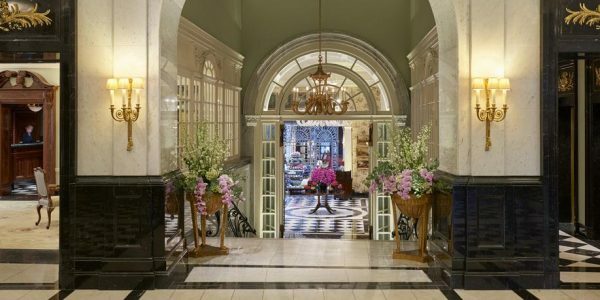 Taking them back to The Savoy, the girl then released the birds into the Thames Foyer – now where The Savoy Afternoon Tea is taken. Among startled guests, staff clambered across the room, hurriedly collecting all the birds back. In response to this inspired story a bespoke print was designed for The Savoy that lines the uniforms reflecting the colours of the interior as well as the flurry of birds. After a short break along came the third course; a selection of afternoon tea pastries. There is choice of five pastries – all of which are delectable. I particularly liked the “Citrus with a Twist” whereas her Ladyship went for the “Classic Opera”. More fresh tea and if you can fit them extra afternoon tea pastries were offered. 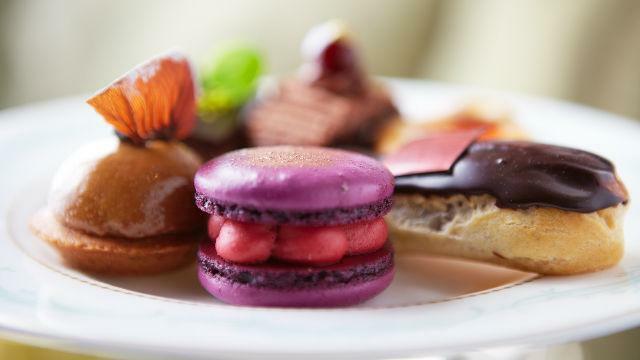 Always hard to resist having another mouth-watering afternoon tea pastries! By this stage we were getting rather full so had to rest for a while before continuing to the fourth course. However, we could not refuse this last course of a slice of the Thames Foyer signature cake being either a Flourless Chocolate Cake or a Strawberry Victoria Sponge. Flourless Chocolate Cake is a chocolate lovers delight with chocolate, chocolate and yet more chocolate, the traditional Strawberry Victoria Sponge was light and scrumptious. After partaking of The Savoy Afternoon Tea for three hours – time flies when you are enjoying one’s self – it was time to leave. 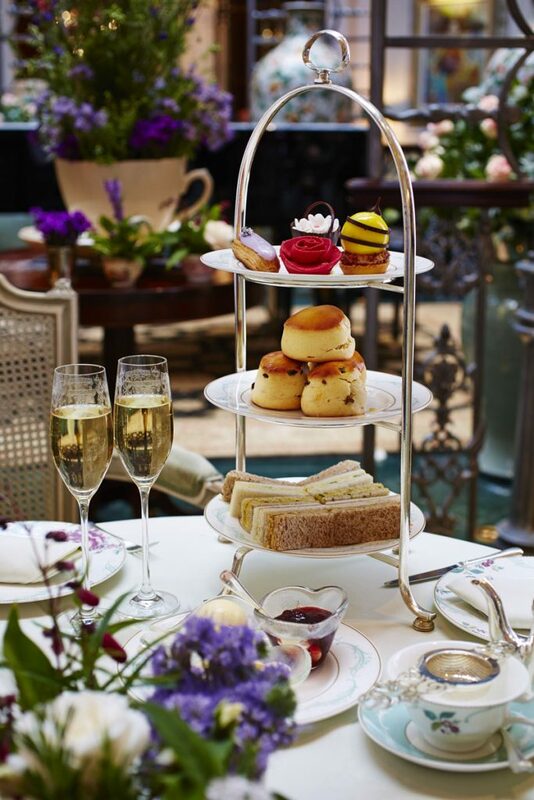 We would like to thank the staff of The Savoy, particularly the team in the Thames Foyer, especially Kieron, for making our Traditional Afternoon Tea such a delight, something not to be missed in one of London’s most iconic hotels steeped in history!